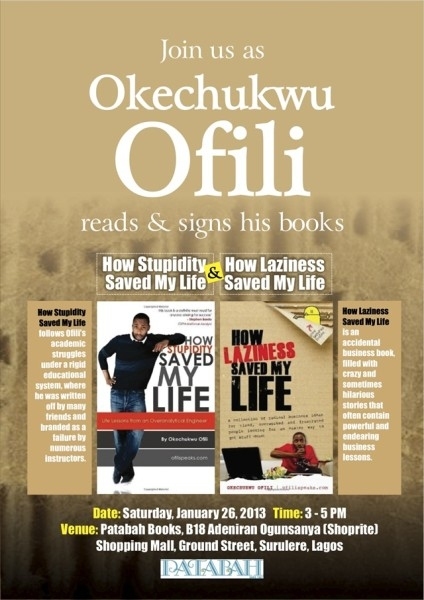 Click to enlargeJoin Patabah Books this Saturday as they present a book reading with Okechukwu Ofili. He will be reading from and signing his insightful and incredibly funny books – How Stupidity Saved My Life and How Laziness Saved My Life. Admission is free for all. Bullet Description: Join Patabah Books this Saturday as they present a book reading with Okechukwu Ofili. 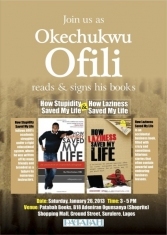 He will be reading from and signing his insightful and incredibly funny books – How Stupidity Saved My Life and How Laziness Saved My Life. Admission is free for all.